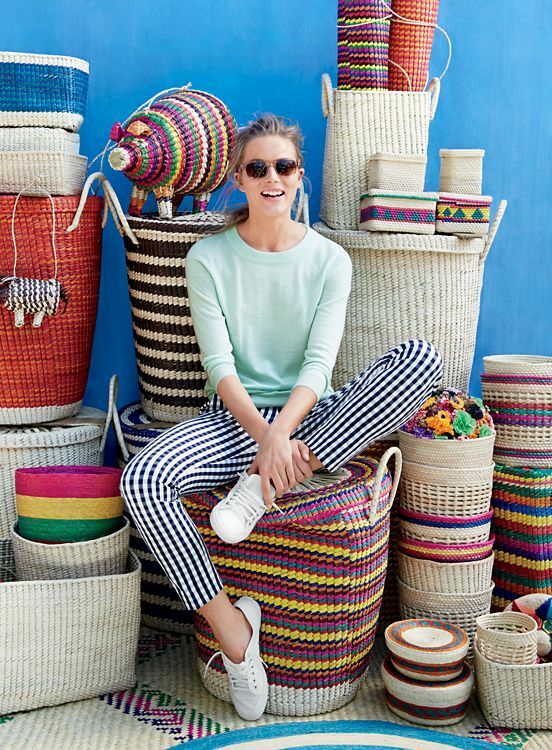 While we’re living in a winter wonderland, more spring arrivals are rolling out so I stopped in J.Crew to check out the offerings from their March 2016 catalog. Due to weather, the store was a few days behind their scheduled rollout so when I stopped in, they were literally pulling stuff straight from the boxes. So, I didn’t ask the SA to dig through too much stuff but I did request a few items to try. A few items I want to try appear to be online only, including the Drapey Pant in Polka Dot and the Collection A-line silk twill skirt in watercolor floral. I am still very much in winter clothing mode but it was fun to try a few items for spring and think about warmer weather. First up, the Martie Pant in Gingham and the Tippi Sweater in Neon Dahlia. This Neon Dahlia color keeps calling to me…I loved Silk Clip Dot Blouse in the same color (you can see it in this post) and it is still on my wish list. I grabbed the sweater to have a top to try on with the pants. I am wearing a size Large in this Tippi and a size 12 in the pant and while I now think I’m solidly between two sizes of Tippi sweaters, knowing that I wash them and they shrink a tad, I’m ok with the larger size and I liked the way L worked with these pants. The pants are a little higher waisted so I liked that I can cover the waistband with them. 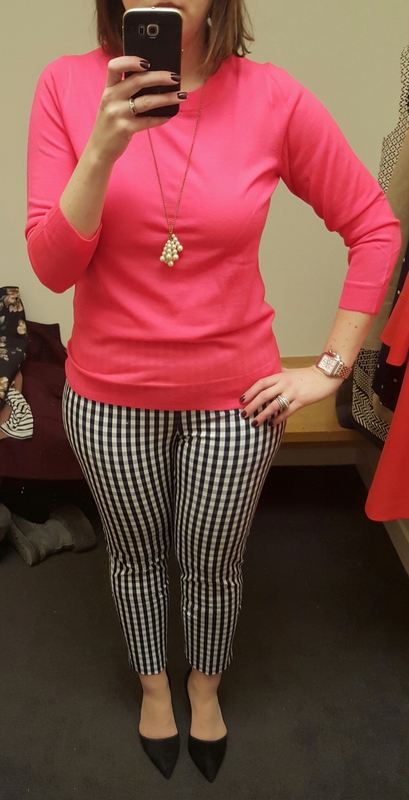 While I have one or two gingham shirts, I admit it’s not a pattern that I can’t get enough of, but I really liked these pants and I loved them paired with this sweater. I think the length on them is good for warmer weather, although thinking about them after looking at photos again, I would be curious to try the tall version of these. I also really like the catalog cover shot of these pants with the Tippi in Heather Spearmint and white sneakers. Next up isn’t a new item but there was one left in my size so I tried it on; the Chateau Trench Coat in Barley. I have the Chateau Parka which has quickly become a favorite winter coat, even though I wish I had sized down to a 10 in it. 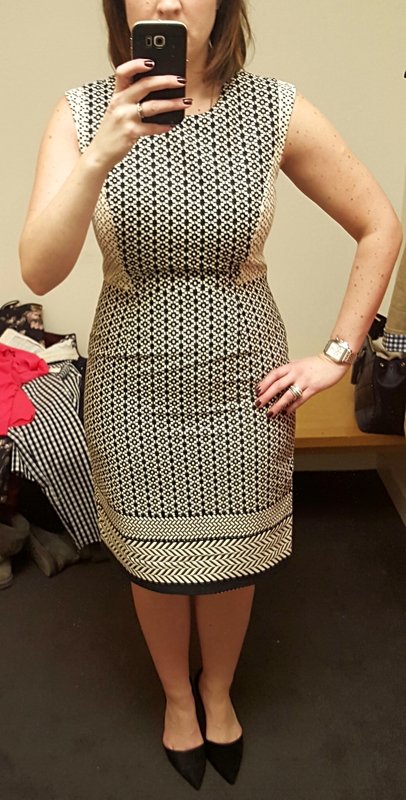 This is a size 12 and I would agree with other reviews that it runs slimmer than it’s winter counterpart. I wouldn’t go any smaller than this and I only had one layer on underneath. I like that it has a hood, and the gingham lining is adorable, even though the sleeves are too short with them rolled to show the detail. The flare at the bottom isn’t overly exaggerated and gives the coat a different shape. It’s a cute alternative to a khaki trench, although I would really like to see it in navy. I’m still thinking about it though. I wanted to try the Paneled Geometric Teddie Pants or the Pencil Skirt, but my store had the Paneled Geometric Dress so that was my option. This is a size 12 and it has zero stretch. The tag said it was 95 % cotton/5% polyester. 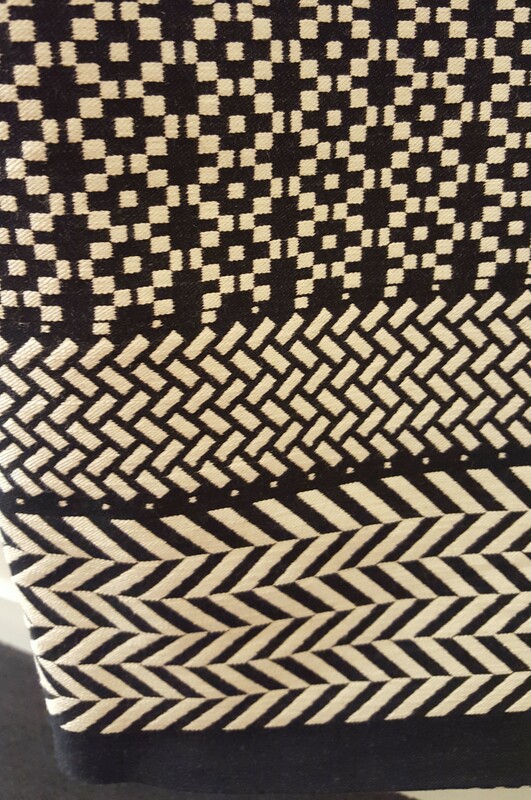 The material is a woven black and and ivory/natural, the white it isn’t bright white. This wasn’t a perfect fit on me so it’s a pass. The hips were definitely tight but the waist and mid-section were a bit loose. The length on it was perfect, right at my knee. I’d probably have to size up in the pants or the skirt if I wanted to try that. Props to this dress being all cotton though and the woven material was very substantial. Here’s a close-up of the material at the shoulder and hem. Next up, the Bell-Sleeve Crepe Dress in Dark Papaya. This dress has been online for a few weeks but I think is only just featured in the current catalog. I tried a 12 first but it was loose all over so I tried a 10 which just fit, it was a little tight through the shoulders and shorter than I would have liked. The size 10 is on the left (photo with the necklace) and the size 12 is on the right. 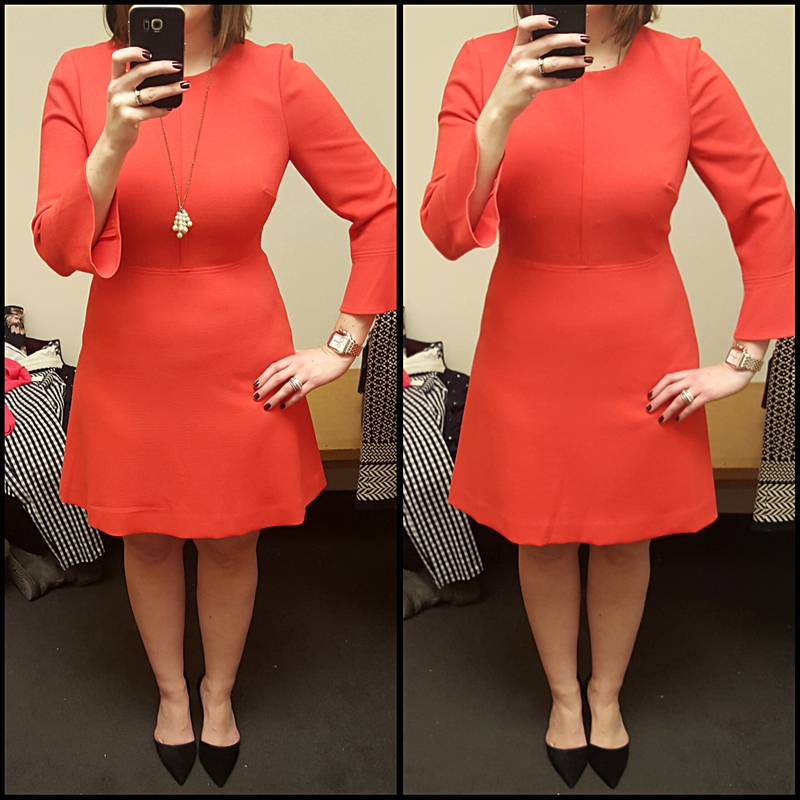 Looking at the photos – it’s tough to tell the difference but the size 10 was at least an inch shorter on me and smaller through the arms. I had plenty of room in the bust in both dresses which is a rarity. I think a 10 Tall would be the perfect size for me in this dress. I felt like I was straight out of an episode of Mad Men in this dress. It has a fuller skirt than we’re used to seeing in most of J.Crew’s suiting dresses and between the flared skirt and the flared sleeve it’s a little too cutesy for me. Maybe in black and I know the shell pink would be way too light on my skin tone. Lastly, the Pleated Midi Skirt in Polka Dot. 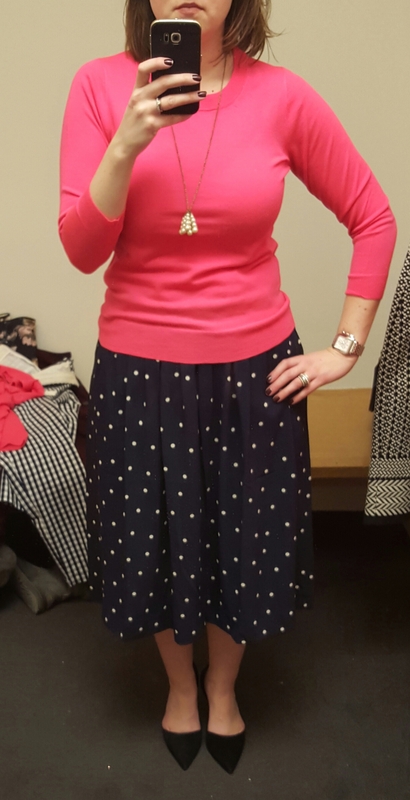 I have the striped version of this skirt from last year in a size 12, and never tried the size down, so I tried a 10 in this skirt, which worked well. I would say you could take the smaller of your two skirt sizes. It hits below the knee for me at 5’8″ and the website lists it at 29″ long for the regular length. I’m wearing a size Medium in the Tippi with the skirt – the size large looked way too sloppy with the skirt and I can never quite get the half tuck right. I liked the trimmer fit of the size medium with the skirt. I would probably opt for my smaller Tippis as I do with my striped midi skirt. This was a cute skirt – I wore mine in to early fall last year. The polyester material seemed similar to last year’s striped versions. It’s not a must have for me at this point so I’ll wait and see how the polka dot pants work out on me. So…just a few things to share, hopefully I can get back in the store to try more items once they get the full rollout in place. The gingham pants and the Tippi did find their way home with me. It’ll be a while before I can wear the pants – but hoping maybe when I get to travel south for warmer weather in the coming weeks! How about you, anything you’re loving from the latest rollout? Would love to hear what you think and thanks for visiting! Thanks for all the reviews. 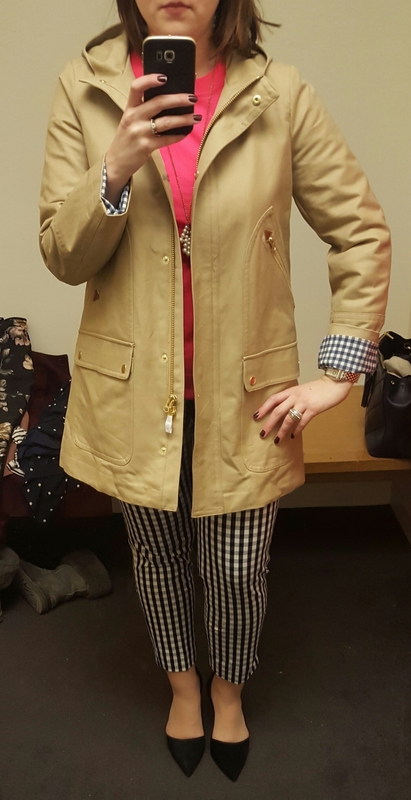 Wow, the gingham Martie pants, neon dahlia Tippi and Chateau Trench make a fabulous outfit! 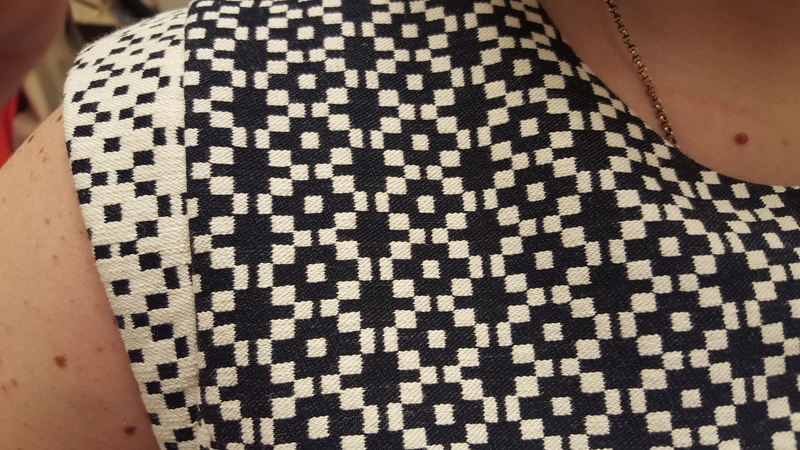 I didn’t realize the Paneled Geometric dress is cotton. Definitely warrants a closer close.